You may not know what we do by our name, but what you do see in our name is our concern for the indoor environment around you and your family. Our emphasis is cleaning for your health. Cleaning for cleanliness, preventative maintenance and end results that are second to none. For the best carpet cleaning Southern Maryland has to offer, call Indoor Environmental Services. Indoor Environmental Services, is a certified carpet specialist that can provide a restorative cleaning in the state of Maryland. Let us educate you about proper carpet care and maintenance. 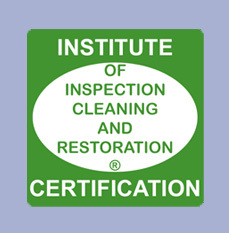 Indoor Environmental Services is certified through the Institute of Inspection Cleaning and Restoration Certification (IICRC) based on proper education for the cleaning of textiles and also for the health and well being of the occupants of your home or facility. The IICRC, Headquarters in Vancouver, Washington, is the most recognized certification by all carpet manufacturers. If you want the job done right and the results to show for it, you need a certified cleaning specialist. Check out the www.iicrc.org/ website for additional information. Our company can teach you proper care through our education and knowledge of the most up to date cleaning standards in the industry. Our equipment is the most up to date and top of the line that is offered by the cleaning industry in today’s market. Have my carpets been wet for 2 to 3 days after prior cleanings? Do my carpets appear to be re-soiling faster after prior cleanings? If so, Why? To what degree do my new carpets need to be cleaned & maintained? Is my older carpet worth being revived? Indoor Environmental Services can answer these questions for you, as well as others. Our answers as well as our business is based on honesty and integrity, we would expect you to accept no less from us. We provide quality carpet cleaning southern Maryland residents love. See our complete service area here. Indoor Environmental Services would like to offer our services to you. We are cleaning specialist in our field and our goal is to help you, our customer.